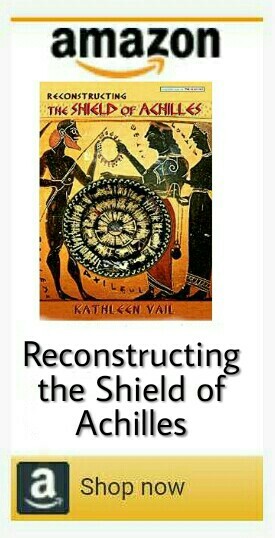 Finally, my dream has come true and my book, Reconstructing the Shield of Achilles, is now published and available on Amazon.com! It is my great honor and pleasure to work with Dr Kenneth Atchity as my literary manager while his company, Story Merchant Books, brings my dream to fruition. You may remember Dr Ken from my earlier post reviewing his wonderful book, Homer’s Iliad: The Shield of Memory. Imagine my joy and excitement when he and his company accepted my work for representation and publication! Et voila’ – Here it is – a dream come true! Although Reconstructing the Shield of Achilles is officially launching on Saturday, October 6, both the ebook and the paperback version are already available for sale on Amazon sites all over the world. The paperback version is also being distributed through Ingram, which means it’s available to all the major markets, such as bookstores, universities, libraries, etc. Free Downloads From October 6-10! To celebrate the official launch of Reconstructing the Shield of Achilles, the Kindle ebook version will be free to download for the first 5 days. I hope you’ll take advantage of this opportunity! Forgive me while I toot my own flute, but I think the book came out really nice and the ebook is something pretty cool – it’s a “print replica,” which means it’s an exact replica of the paperback, with the page breaks and page numbering preserved. Like the paperback, the Kindle ebook version is filled with beautiful images of ancient Greek vases and archaeological artifacts illustrating the story of Achilles and his spectacular shield. Unlike the print version, though, the ebook is also fully interactive, with internal footnotes, bookmarks, tables of contents and illustrations, and lots of links to external websites and resources. If you do take advantage of the free download, I’d love to get some feedback from you. Please post a review on Amazon – I’d really appreciate that a lot! -Vail’s stunning reconstruction has resulted in a more historically and artistically relevant design than ever before presented! Resounding powerfully throughout history, Homer’s ancient narrative of Hephaistos forging the invincible weapons of Achilles, with which he heroically brings the Trojan War to a close, remains timelessly fascinating to audiences of all ages. True to Hephaistos’ promise, Achilles’ immortal shield is “a wonder to behold.” But its actual appearance is a mystery over 2,700 years old, fueling imaginations and debates virtually since the first recital. By documenting and adopting an artistic style of roughly contemporary handiwork, Vail’s stunning reconstruction has resulted in a more historically and artistically relevant design than ever before presented. Based literally and solely on Homer’s specifications in Book 18 of the Iliad, Vail’s life-size shield is made of brass sheets inscribed and painted with enamels, exactly matching Homer’s Greek. Offering a compelling solution to the ancient mystery, Vail’s Shield of Achilles remarkably resembles archaeological artifacts such as bronze swords and daggers inlaid with gold and silver that were found in the royal tombs of Mycenae. Excavated by Heinrich Schliemann beginning in 1874, Mycenae was the ancient Greek realm of Achilles’ Commander-in-Chief, High King Agamemnon. Filled with intimate glimpses of ancient Greek life, Reconstructing the Shield of Achilles offers an exciting exploration of Achilles’ spectacular shield. Not only offering a brilliantly illustrated verse translation of Homer’s elaborate description, Vail also follows Achilles’ armed exploits in battle and launches an expedition in search of Achilles’ shield after his epic death on the battlefield of Troy. Kathleen Vail is a member of the Maker Movement taking on the Classics. Combining career skills as a computer engineer and graphic artist for the US Department of Defense with research skills as a lifetime student of Homer’s ancient Greece, Vail’s reconstruction of Achilles’ shield is enjoying great success since its creation. Her shield appears on the cover of Dr. Kenneth Atchity’s Homer’s Iliad: The Shield of Memory (Kindle Version, 2014), and Carolina López-Ruiz’ Gods, Heroes, and Monsters (2nd Edition, Oxford University Press, 2018). Vail has also presented her work to various groups and organizations, including Virginia chapters of the Classical Association and Mediterranean Society. Please Help Me Share This Great News! I’m sharing this post as widely as possible and I invite you to share it, too. I know my reconstruction of Achilles’ shield doesn’t really rock everybody’s boat, but I’d love to make a little ripple on the pond. Teachers and students of Classical Studies, as well as Art History and Greek Mythology fans may find this interesting, so I’m reaching out for some help to increase the visibility of my work. Please help me share this great news! Thanks!! Congratulations, what a wonderful accomplishment. May it only continue. Thank you very much, Michael! Congratulations, dear Kathleen! I’m sure your book will be a success, and a well deserved one too! Thanks very much, Virginia! I really appreciate that a lot! Hi Kathleen Congratulations on this your fantastic achievement. I must have your book and its just in time for my birthday. So I can let my family know what they can get while they are here. The Shield of Achilles is going to be a well deserved knockout. Thanks so much, Rita – I hope you have a wonderful and very happy birthday! So nice to have family visiting with you, too, what a treat! Wishing you much well deserved success and thanking you for endeavoring to remind our modern technological world of it’s ancient roots and the principles which guided it, for better or for worse. Congratulations! Thanks so much, Ismail! You set a very beautiful example for us all with your love of the ancient world, its ways, wisdom and incredible music. Thanks again for your inspirational friendship and support!